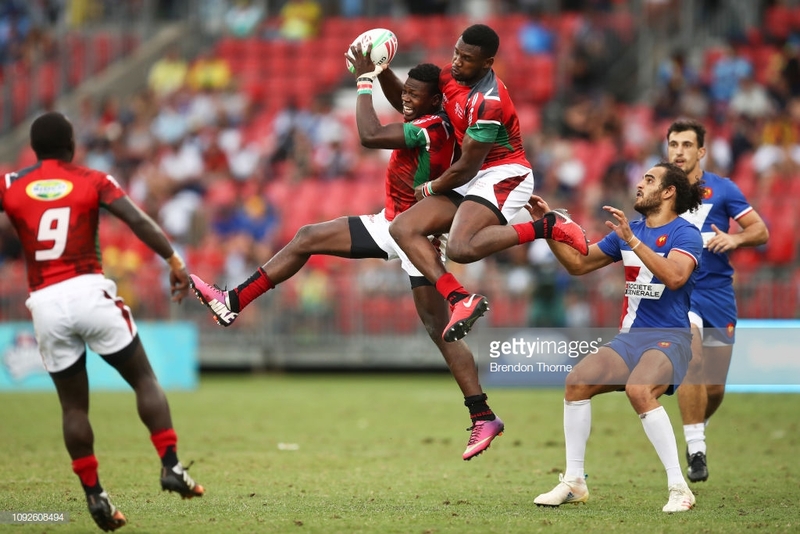 Kenya 7s was on Sunday morning knocked out of Sydney 7s by invitational and non-core side Tonga after losing 20-17 in the 13th place semifinal. Tonga, who went to Hamilton and Sydney 7s as invitational side for being the top ranked non-core side in Ocenia, had not won any match this weekend at Sydney before meeting Kenya. Kenya had dropped to 13th place semifinal after losing 19-14 to Wales in the early hours of Sunday. The defeat means Kenya pick only one point at Sydney 7s, their lowest of this lowest season to move to 12 points. With Wales going out at the Challenge Trophy semis stage, they pick five points to move to 11 just one below Kenya. Japan are also assured of at least seven which will take them to 11 by virtue of reaching Bowl final. Kenya, Wales and Japan head to Las Vegas 7s in March as early relegation candidates. Kenya kicked off the day with 24-14 defeat to Canada before going down 41-0 to former Kenya 7s coach Mike Friday’s USA and eventually 40-17 to France in the last pool match. John Tapueluelu dart across left to score the game's first try after a lovely play early on. Kenya were nearly in, but Eliakim Kichoi's attempted offload at the last was intercepted by Edward Sunia. Jacob Ojee had his first try in Sydney as Kenya had much of the possession since Tonga's score, and Ojee spotted space on the left wing to draw his side level. John Tapueluelu got his second of the game as Kenya conceded a penalty for not rolling away. But Kenya hit back once again. Daniel Taabu accelerated down the left and found Eliakim Kichoi on the inside to leave it level at the break. A great offload from Edward Sunia on the inside to Lotu Inisi put Tonga 15-0 ahead. With Johnstone Olindi in the sin bin, but Kenya suffered a bigger problem asJacob Ojee's ankle got caught beneath a tackle. It looked like a potential horror injury but he was up and running. He was sensibly withdrawn but that could have been a whole lot worse. Vincent Onyala latched brilliantly onto a kick forward, reaching the ball just before it went out of play to score a try. It was Daniel Taabu who kicked, and Akuila Tuha was carded for a no arms tackle on him. Tonga retook the lead with 30 seconds to play as Potolaka Maake took the ball from the back of the ruck and held off a tackle to dot down. Mark Wandetto fumbled the restart out of play and Tonga had their first win of the weekend.